I’ve been to Canada a few times and have always been so impressed with their country – the people there are SO nice and the cities are always beautiful and clean. Banff had been on my travel list for several years – all of the travel accounts I follow on Instagram always post pictures of Banff and it’s so beautiful (I truly thought it just couldn’t be that pretty in real life). But it IS, you guys! The lake waters are more blue/turquoise than the waters I’ve seen in the Caribbean, and the way the mountains jut up against the sky – it is a striking sight. 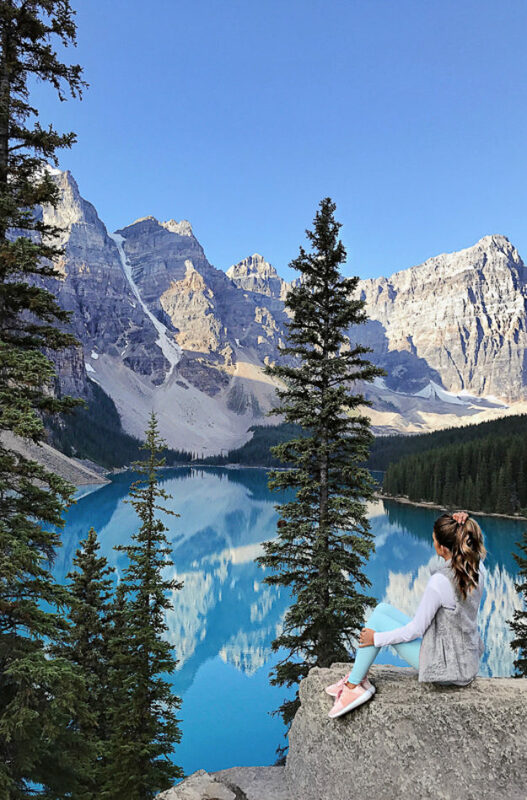 I cried when we got to the top of our hike and saw the stunning view of Moraine Lake – in that moment, I questioned how anyone could doubt God’s existence when you’re looking at His beautiful creation. This would make a great trip for girlfriends, a romantic couples trip or even a family trip with your kids (the hotels we stayed at were incredibly kid-friendly!). The easiest way to get to Banff and/or Lake Louise is to fly into the Calgary airport (YYC). It’s an hour and a half drive from the airport to Banff, so my mom and I chose to rent a car – it’s too far to take a taxi.